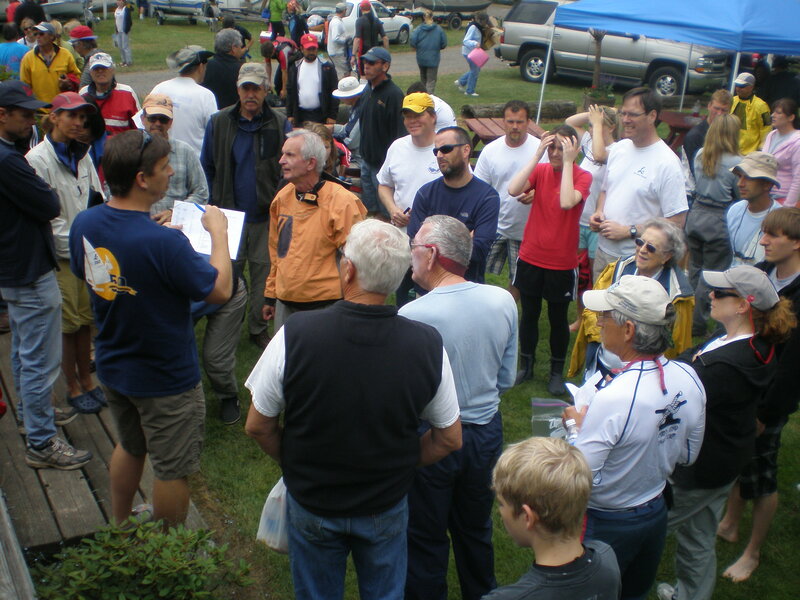 For the first time in as long as anyone can remember, District 6 (Northwest) Lido sailors started the season in early May with the 1st annual Lido Spring Fling on the Willamette River in Portland, OR. The traditional start of the season has been the first weekend in June at the Vancouver Lake Annual Regatta. While it may have come second this year, it was a record turnout for the regatta and for Lido sailors! 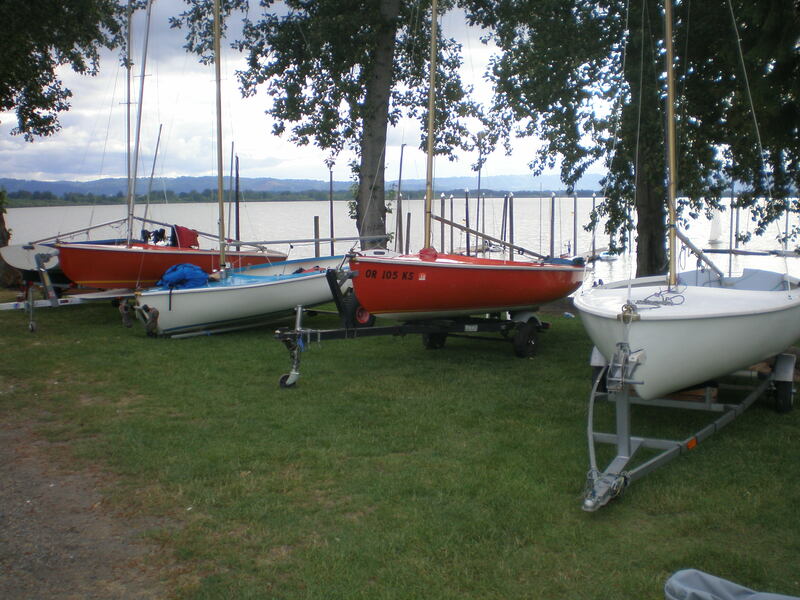 The regatta drew 14 Lido sailors from all over Washington and Oregon – 4 fleets in total – to participate amongst a draw of 75 boats, including: A-Cats, Thistles, Lightnings, Lasers, Vanguard 15s, Geary 18s, Fireballs, and Coronado 15s. This regatta pulls all of the best aspects of our sport together: classic dinghy racing on a great freshwater lake; camping on the lakes edge; a wonderful Saturday evening salmon feast, and good friends. Another first for District 6 was the inclusion of both an A and B fleet, with 9 boats competing in the A group and 5 boats going at it in the B fleet. All boats started and sailed together, and were ranked in the end for A and B results. Saturday started with all Lido crews gathering after the Skipper’s Meeting to introduce themselves before heading for the water. An amazing fun fact discovered during introductions was that 5 of the 14 crews were comprised of Dads and Daughters! Additionally, there were 2 crews of Grandfather/Grandson teams, and 4 crews of husbands and wives. A family affair to be sure! • Steve and Ginger Orsini sailing fast and smart with a 1-2-1 line score in the day’s three races – no one could match them! • Jim and Sarah Mackey came out for their first District 6 regatta since moving from the Bay Area last summer, and had two great races – a 2nd and 3rd. 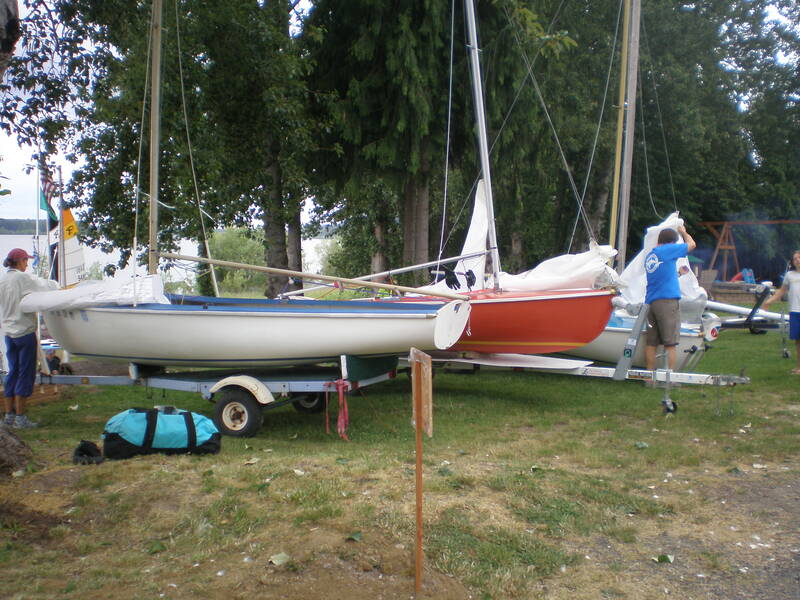 • Chris Lofgren and his daughter came down from Anacortes’ Fleet 78 to participate in the B fleet, but proceeded to score a 3rd and a 4th overall – fantastic! • The District’s senior yachtsman, James Clevenberg (at a mere 81 yrs old) sailed with his grandson who was out for only his second time on the boat – they sailed consistently strong races all day. The race committee, who did a nice job handling a huge turnout on just one course, had some glitches with their score sheet so no results were posted on Saturday night. The one thing everyone knew was that Steve and Ginger were “en fuego”! No one really cared about the results not being posted, because the Lido crew was too busy enjoying the traditional bbq salmon feast served by a locally renowned chef. 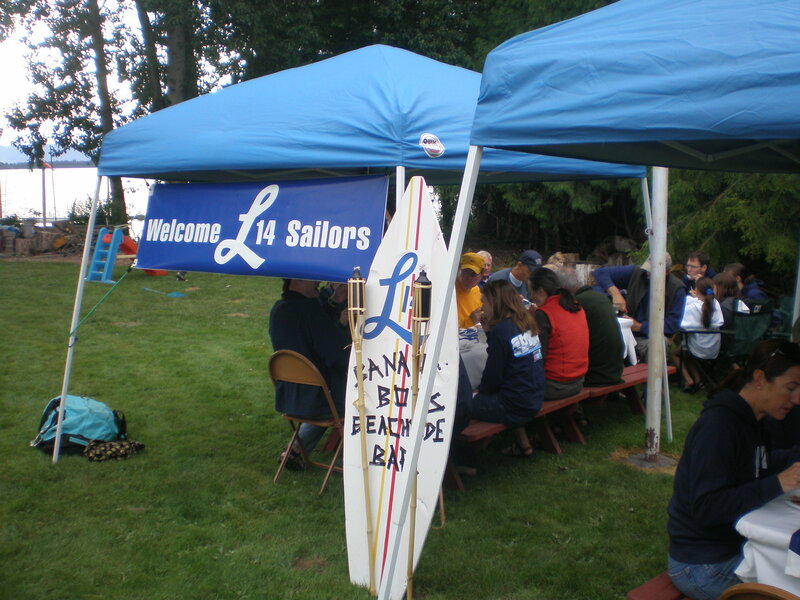 The Lido folks pulled tables together, hung their banner, and even pulled out a surfboard from last summer’s Lido Luau from the Eugene CCR!! The food was great, the beer and wine were great, but the company was the best. 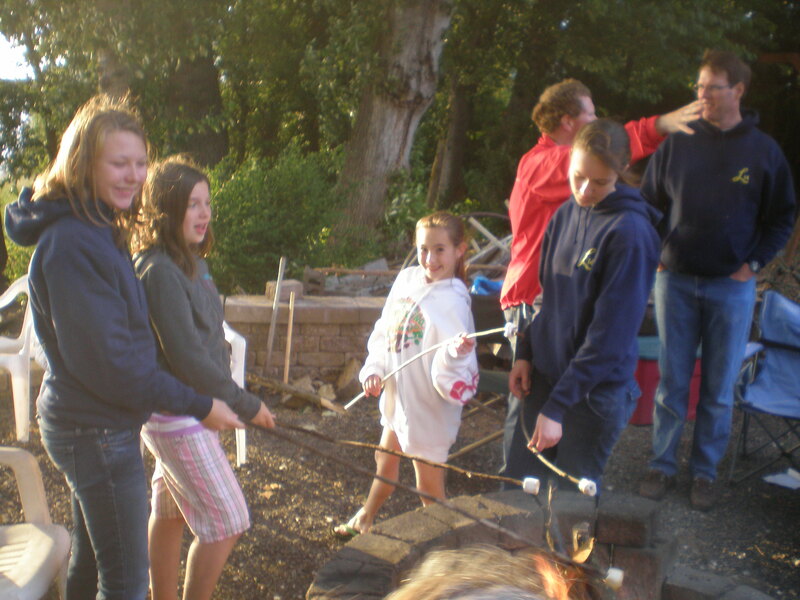 The campers in the group stayed up well into the evening discussing the finer points of Lido racing, travel regattas, freak squalls on the Willamette River in May, smores, and plans for attending this summer’s CCR in Mission Bay. Sunday morning brought great wind and weather, and the promise of a full day of racing. All the competitors got out on the course, and realized that the wind was oscillating 60+ degrees, which forced the race committee to pull anchor and reset the line 5 times before finally getting to the Lidos start (the 9th start!). Sadly by the time all the postponements and course corrections were completed and our starting horn went off, the wind had dropped to 0 to 3 knots – a drifter. The Lido’s battled the conditions and each other to eke out every bit of momentum in the whisper of wind on the course. Jim and Sarah Mackey shot out the pin end with their own private patch of wind to a huge lead half way up the beat. Only Garrett Johns and his daughter Halsey were able to track them down at the weather mark. Garrett managed to stretch out his lead and win the race going away. The Mackeys kept the rest of the fleet behind them for a second. Steve and Ginger struggled just a bit with the conditions (who didn’t?! ), but still managed a 5th in what turned out to be the one and only race of the day. With only four races there was no throw out, which ended up rewarding consistency. Quietly putting a line of 4-4-2-3 was Jim and Carolyn Sterner to take second place in A fleet behind Steve and Ginger Orsini. And with his 1st place in the last race, Garrett Johns came in 3rd in A fleet. In the B fleet, Chris Lofgren and his daughter took home 1st with room to spare, while Toby King came in 2nd, and James Clevenberg took 3rd. The District 6 travel squad just keeps growing slowly – mainly due to a great group of people who support each other and have fun as their top priority. The next chance to join this group is coming up soon at The Emerald Cup Regatta down in Eugene, OR on June 27th and 28th. This regatta had 19 Lidos last year and promises another opportunity for camping, bbq, great racing and friends. Don’t miss it!